The Service Manager is displayed in the Console in the left-pane tree-view, and is used to configure the core services running on Mailtraq. Multiple instances of services can be run but those which run on the TCP/IP network protocol cannot share a port unless configured as multi-homed (find out more here). Services can be added simply by clicking [New] in the Services context (right-click) menu. 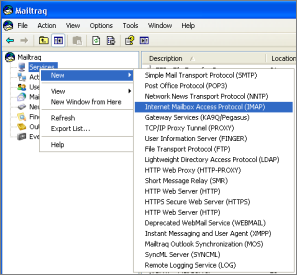 It is often necessary to adjust the local Firewall and the network Router (discussed here) to allow new services access to and from Mailtraq. The Active Connections node in the Console Tree will indicate which Mailtraq services and connections are currently active and on which port. In addition to the HTTP service listed within the Service Manager, Mailtraq also provides a full function Website Server configured from Options | Web Sites.